Subaru Impreza is an automobile which has been manufactured since 1992. Subaru - America Inc. has shown eight consecutive years of sales growth. Every five-year cycle, Subaru introduces new models. The latest Subaru Impreza debuted in 2012. 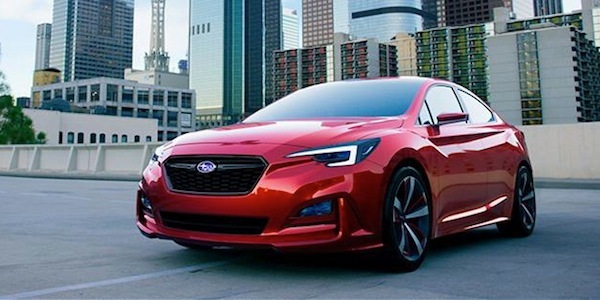 They have introduced the 2017 Subaru Impreza Sport Sedan at the New York International Auto Show and the sale will start in the late fall of 2016. ● Sedan and 5 door styles. ● Slightly bigger in size. ● Big time in saving fuel. ● The tires of the car are designed in such a way that they are well-balanced no matter the road conditions - bumps, rain, or snow. ● New Sports version with 18 inch wheels, Sport Suspension and Active Torque Vectoring. ● For safety, new features have been added, such as Subaru Eyesight, Blind Spot Detection and Reverse Automation Braking, Steering responsive LED Headlights, and High Beam Assist, which give drivers more confidence. ● By using Subaru STARLINKS and MySubaru app, the car can be locked and unlocked remotely. ● Special features, such as Apple Carplay and Android Auto have also been added. ● Higher performance in increased horsepower from 148 to 152 and 2.0 litre Boxer Engine with Direct Injection. Subaru has manufactured Impreza in Japan since 1992 but the 2017 Impreza is the first to be manufactured in the U.S.